I don't know about you, but there are some days where dinner better be quick and easy to fix or forget it. Today was one of those days. Not a big fan of mustard? Not to worry. This is one recipe where the combination of ingredients provides the flavor versus one flavor hog. 1. 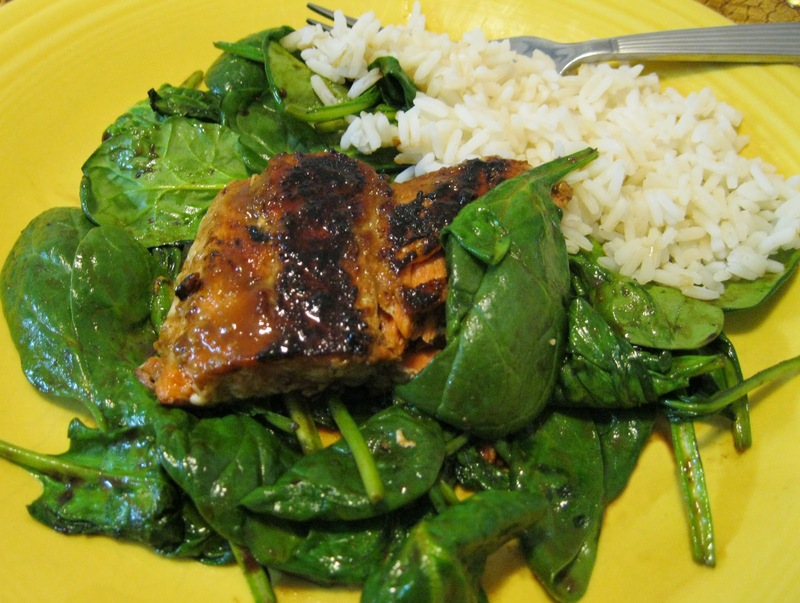 In a microwave-safe bowl, cook the brown sugar, honey, mustard and soy sauce for 30 seconds or until melted. Stir in the ginger. 2. Heat a large nonstick skillet coated with nonstick cooking spray over medium heat. Coat the salmon filets with nonstick cooking spray and place skin side down in the skillet. Spread some glaze over the filets and cook for 5 minutes or until golden brown and crispy. 3. Turn the filets, spread with more glaze and cook another 5 minutes or until the salmon flakes with a fork. Add the remaining glaze to the pan and cook 1 minute until bubbly. Serve the sauce with the salmon. Because of preparing only one large filet cut in half, I measured out just slightly less per each ingredient called for. Definitely going to add a little fresh grated ginger too. 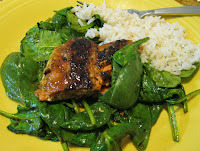 After removing the filets and most of the sauce, I kept a little in the skillet and tossed in some fresh spinach.